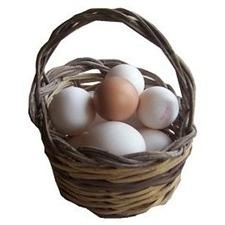 A good piece of general advice is not to put all of your eggs in one basket. If you drop it, you will lose all your eggs. With investments, this means that you shouldn’t put all of your finances into a single company. This is a thoroughly Biblical thought. “Divide your portion to seven, or even to eight, for you do not know what misfortune may occur on the earth” (Ecclesiastes 12:2). However, there is a Biblical exception to this rule. Believers in Jesus Christ have placed all of their eggs in His basket. We believe in His saving power. If He fails, we all fail. “If Christ has not been raised, our faith is worthless; we are still in our sins. … If we have hoped in Christ in this life only, we are of all men most to be pitied” (1 Corinthians 15:17, 19). But, the reality is that “Christ has been raised from the dead” (1 Corinthians 15:20). He has the power to save.